As a general rule, when I get incredulous about a film getting released it’s because it’s a useless sequel or remake... or it has Adam Sandler starring in it. 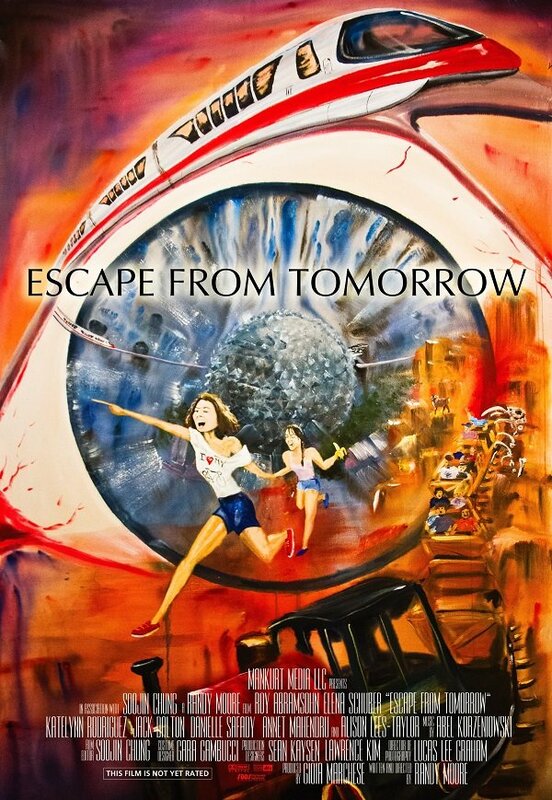 It’s an entirely different story when it comes to Randy Moore’s one of a kind surrealist fantasy Escape From Tomorrow. It made big waves at Sundance, but because it was filmed discreetly inside both Walt Disney World and Disneyland without the company’s permission it didn’t seem likely that general audiences would ever legally be able to see it. Amazingly, however, Producers Distribution Agency (PDA) has picked up the rights to the film, according to the Los Angeles Times, and they’ve partnered up with Abramorama and FilmBuff to release the film theatrically in select cities on October 11th - coinciding with a VOD release on the same day. I just went from not knowing if I’d ever see this flick to knowing that I can watch it in less than two months. I’m so used to being disappointed by 2013 that I’m unsure if this feeling is joy, or if I'm dealing with some sort of gas leak situation. There's still time for the other shoe to fall in regards to this film, as Disney has yet to make any official comment on it, either negative or positive. It’s possible that set distribution plans could be what Disney's team of lawyers has been waiting for, but it's been said that the company’s name isn’t outrightly damaged during the film, as it was based on Moore’s emotional ties to the park as a child. But some people came away from Sundance saying it had an anti-Disney vibe, so maybe that will be all it takes. Regardless, insurance has been purchased, which should protect the film against liabilities. Escape From Tomorrow follows a man (Roy Abramsohn) and his family as they spend a day at the theme park. Unfortunately, the day turns into a surrealist nightmare as the family dynamic splits and the man becomes interested in two French girls (Annet Mahendru and Danielle Safady). The park attractions and workers turn sinister, but he isn’t sure if it’s actually happening, or if he’s having a mental breakdown. The production stories behind the film are pretty amazing, and it makes sense that a company like PDA is putting it out there, given they released the Banksy documentary Exit the Gift Shop, along with the chess doc Brooklyn Castle and Senna, the biographical documentary about the Brazilian Formula One champion Aryton Senna, widely thought to be one of the greatest, if not the greatest, race car driver of all time. The IFC Center in New York is definitely hosting the film, while other cities will be announced. FilmBuff is putting out the VOD, which should make it available to just about everyone.